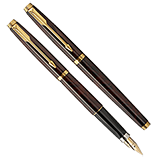 Vintage Parker Fountain Pens - All of our vinatge pens are fully restored to good writing condition unless otherwise noted. By “good writing condition” is meant, in addition to proper function, that nibs are aligned, set for reasonable flow, and not scratchy. Particularly nice writers are so noted in their descriptions. Except for pens that are described as being in “mint” or NOS condition, these are used pens. 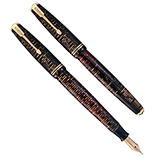 We guarantee all of our restoration work (resacking, nib adjustments, etc. 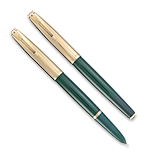 ), and we ship the pens in good working order. 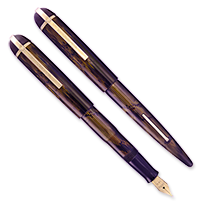 However, they are still used pens, and we cannot make the same guarantees against defects or for length of life that their manufacturers made (such as Sheaffer's Lifetime guarantee). 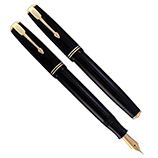 This image indicates a pen with a specialty nib.